You can buy a registration key for our software via PayPro secure payment systems. 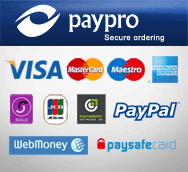 PayPro offers the following payment types: PayPal, credit cards, bank transfers, phone, checks, WebMoney, Yandex Money etc. Entitles you to use the program on two computers. After you buy the license, you will receive text license file, which you should copy into program folder (near file "Viewer.exe"). If license file is valid, program should consider itself as registered. when entering your name in the order form, please don't use letters with umlauts, as this causes problem with the final key. you can buy business/site license for our software through Softkey Poland.